Apple today updated its Apple Store app for iOS devices with support for Siri Shortcuts (iOS 12 feature). 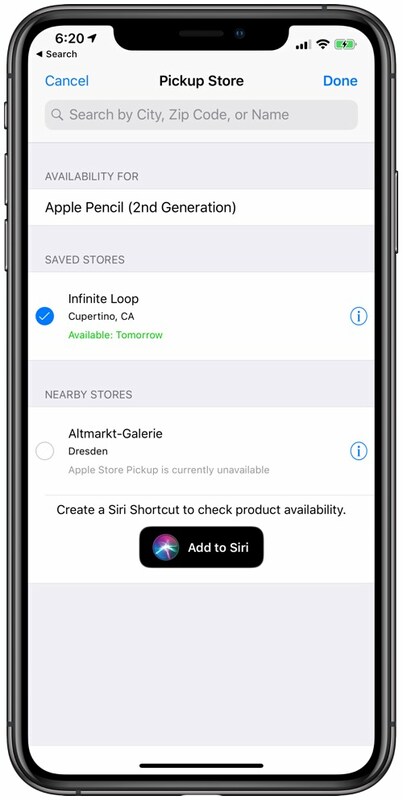 Siri Shortcuts for the Apple Store app can be used to create custom voice commands to check product availability or the status of a recent order. The Siri shortcuts can be used without having to open the Apple Store app, allowing users to retrieve important information in fewer steps. If you select the My Orders page, there is the Add to Siri button, which you can use to check the order status. Similarly, when viewing pickup options in an item's store, you can use the Add to Siri button to create a custom Siri link. According to Apple's release notes for the Apple Store app, the update also provides support for locations in Puerto Rico. 1; Siri Shortcuts let you create custom voice commands to check the product availability or status of your most recent order without having to open the app. – The new iOS 12 features and functionality make the app even more user-friendly.